Can you believe it? 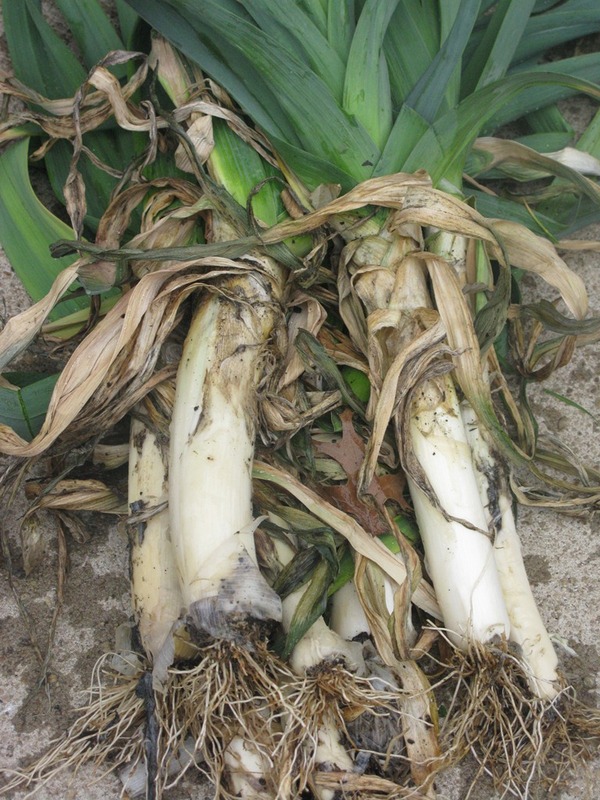 We are still harvesting leeks we planted on March 8, 2010. This is what they look like. A bit worse for wear, yes. But once you peel away all the gnarly stuff, the leeks are still tender and delicious. But with spring moving in fast, and temperatures rising, we are trying to eat them as quickly as possible. MAKE THE CRUST In a food processor, pulse the 2 1/2 cups of flour with the salt. Add the butter and pulse until it is the size of small peas. Add the egg yolk and ice water and pulse until the pastry is moistened. Turn the pastry out onto a floured work surface and knead 2 or 3 times, just until smooth. Pat the pastry into 2 disks, wrap in plastic and refrigerate until firm, about 20 minutes. Preheat the oven to 375°. On a floured surface, roll 1 disk of the pastry to a 12-inch round. Ease the pastry into a 10-inch fluted tart pan with a removable bottom without stretching. Trim the excess and use it to patch any holes. Refrigerate the tart shell for 10 minutes. Repeat with the remaining pastry. Line the tart shells with foil and fill with pie weights or dried beans. Bake the tart shells for 30 minutes, just until dry. Remove the foil and pie weights and bake the crusts for about 15 minutes longer, until they are dry and golden. Transfer the tart pans to 2 sturdy baking sheets. MEANWHILE, MAKE THE FILLING In a large skillet, cook the bacon over moderately high heat, stirring, until browned and crisp, about 7 minutes. Drain the bacon, leaving 1 tablespoon of the fat in the pan. Add the leeks and thyme to the skillet, season with salt and white pepper and cook over moderate heat, stirring occasionally, until the leeks are softened but not browned, about 5 minutes. Transfer to a bowl and let cool. Stir in the bacon and cheese. 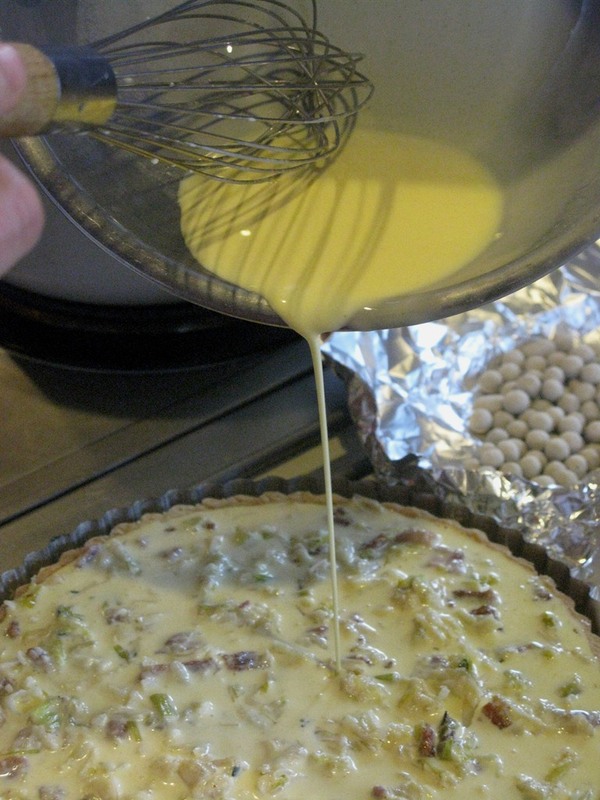 Divide the bacon-and-leek filling between the tart shells. In a bowl, whisk the eggs with the egg yolks and heavy cream. Season lightly with salt and white pepper. Pour the custard into the tart shells and bake for about 30 minutes, rotating the sheet halfway through for even baking, until puffed and lightly browned. Transfer the quiches to a rack and let cool for 15 minutes. Remove the rings, cut the quiches into wedges and serve.